Downey Plumbing has been providing fast, dependable heating and air conditioning solutions to both homeowners and commercial clients for over 80 years. With a commitment to the comfort and health of our customers, we are ready to help you and your family stay relaxed and save on energy costs through our heating and air conditioning services. 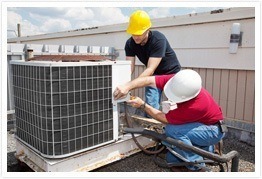 Along with providing you with help from one of our highly trained technical experts, our primary goal is to satisfy all of your heating and air conditioning needs. Our services range from annual maintenance to complete installation for new construction. Our innovative products, reliable service, and the highest quality standards will ensure your 100% satisfaction! Whether you are interested in replacing an existing system for a more energy-efficient system, you need a few minor repairs, or you are interested in a brand new installation, we can help. Remember, no job is too big or too small. We are well aware that when your heating or air conditioning system is not working properly, it can cause discomfort for you, your family and your clients or employees. We provide some of the most cost-effective service in the area. If you require emergency service, we are always available 24 hours a day, 7 days a week!